The RP Photonics Buyer's Guide contains 4 suppliers for cladding mode strippers. In a high-power fiber amplifier made from a double-clad fiber, residual (unabsorbed) pump light (at the fiber end opposite to the pump end) may have to be removed from the pump cladding (inner cladding) in order to prevent it either from accompanying the amplified signal or from getting to the signal source. A special cladding mode stripper may be used for that purpose. When pump light is launched into a double-clad fiber (for example, from free space), some of the optical power may get into the outer cladding around the pump cladding. It may propagate in that outer cladding up to a location where the fiber has a polymer coating, and then destroy that coating via excessive heating. That problem may be avoided with a cladding stripper which attenuates light in the outer cladding, but not in the pump cladding. Cladding mode strippers for use in high-power fiber lasers and amplifiers need to be able to handle substantial optical powers. It needs to be ensured that these powers are absorbed in a sufficiently widespread region, and that the generated heat can be removed safely, without damaging the mode stripper or any surrounding parts. White papers and videos are great instruments for creating an interest in your technology and demonstrating the capabilities of a company. But how to publicize them, reaching the right audience? Our suggestion: place a preview in a suitable encyclopedia article! 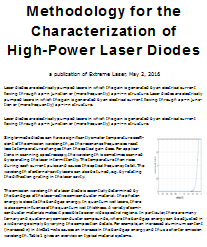 For example, the paper preview shown above would well fit into our articles on laser diodes and diode bars.